How do you separate your thoughts into ilovebokkie creativity and the interior work you do for Sketchbok? Or do you feel the flow is seamless? Sketch Bok/DBN has become my 9-5 and ilovebokkie sort of fits in between. I mostly work on new products for ilovebokkie on the weekends when I’m a little more relaxed, but ideas don’t stick to a schedule, so they do pop up at the strangest times. I just juggle the two! I suppose it is seamless in a way. What lead you to owning your own creative business? I wanted to get recognition for my designs and I wanted more freedom of time so I could spend more time with my now 2 year old son, Rylee. What are your top tips for being your own boss? Be Organised, disciplined and I always have a to-do list! Cannot function without them. And never lose the passion for what you are doing and what you love. What is a perfect Christmas like in your household? Just being surrounded by those you love. Earlier this year my sister (who is my best friend) relocated to Joburg and my father past away from cancer, so family time has become so very important to me and I really treasure our time together. Are there new products and ideas that we can we look forward to in 2012? I’m in the process of creating a kids rocker, cool ottomans, chair slipcovers and growth charts. So watch this space! Plus there’s a whole furniture range by Sketch Bok/DBN on the horizon! Wendy from ilovebokkie is giving away four of her beautiful Christmas decorations. They are so pretty that they will look good in your home all year round! 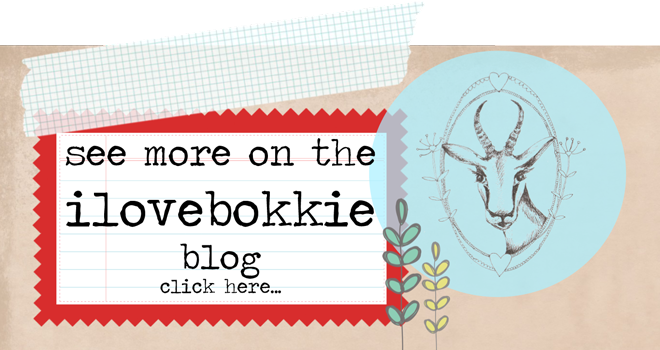 All you have to do is follow the ilovebokkie blog and leave a comment here to mention that you have followed. Closing date: Monday 19th December.